Abilities: As he can get up to 1.8 times more use out of a unit of fuel than the next most efficient Autobot, Bumblebee is often called upon at times of low energy resources. 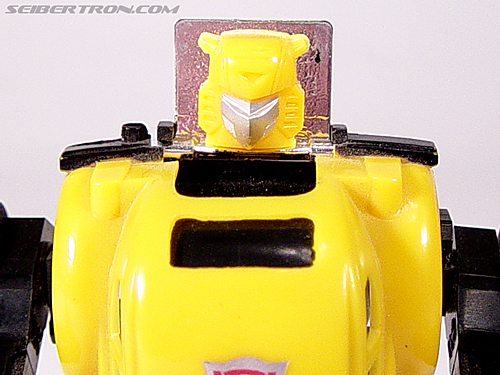 His visual acuity rates tops of all Autobots: he can spot a 10" x 10", object at a distance of 48 miles on a clear day. His adaptability to water environments makes him particularly important in undersea reconnaisance and salvage operations. Weaknesses: Bumblebee is physically the weakest of the Autobots and the most easily damaged. His stealth more than compensates for this liability. The Transformers #1 - "The Transformers"
The Transformers #2 - "Power Play!" The Transformers #3 - "Prisoner Of War!" The Transformers #4 - "The Last Stand"
The Transformers #5 - "The New Order"
The Transformers #6 - "The Worse Of Two Evils!" The Transformers #8 - "Repeat Performance"
The Transformers #9 - "Dis-Integrated Circuits!" The Transformers #10 - "The Next Best Thing To Being There!" The Transformers #11 - "Brainstorm!" The Transformers #12 - "Prime Time!" The Transformers #14 - "Rock and Roll-Out!" The Transformers #15 - "I, ROBOT MASTER!" The Transformers #16 - "Plight of the Bumblebee!" The Transformers #19 - "Command Performances!" The Transformers #21 - "Aerialbots Over America!" The Transformers #23 - "Decepticon Graffiti!" The Transformers #31 - "Buster Witwicky and the Car Wash Of Doom"
The Transformers #37 - "Toy Soldiers!" The Transformers #58 - "All The Familiar Faces!" The Transformers #59 - "Skin Deep"
The Transformers #60 - "Yesterday's Heroes!" The Transformers #61 - "Primal Scream"
The Transformers #65 - "Matrix Quest (Pt 4): Dark Creation"
The Transformers #66 - "Matrix Quest (Pt 5): All Fall Down"
The Transformers #69 - "Eye of the Storm"
The Transformers #76 - "Still Life!" The Transformers #77 - "Exodus!" The Transformers #Holiday Special - "The Night The Transformers Saved Christmas"
Transformers (UK) #2 - "The Transformers"
Transformers (UK) #3 - "Power Play!" Transformers (UK) #4 - "Power Play!" Transformers (UK) #5 - "Prisoner Of War"
Transformers (UK) #13 - "The Enemy Within (Part 1)"
Transformers (UK) #15 - "The Enemy Within (Part 3)"
Transformers (UK) #16 - "The Enemy Within (Part 4)"
Transformers (UK) #17 - "The Enemy Within (Part 5)"
Transformers (UK) #19 - "Raiders Of The Last Ark (Part 2)"
Transformers (UK) #22 - "The New Order"
Transformers (UK) #23 - "The New Order"
Transformers (UK) #26 - "Warrior School"
Transformers (UK) #29 - "Decepticon Dam Busters (Part 1)"
Transformers (UK) #30 - "Decepticon Dam Busters (Part 2)"
Transformers (UK) #33 - "Disintegrated Circuits"
Transformers (UK) #35 - "The Next Best Thing To Being There!" Transformers (UK) #37 - "Brainstorm!" Transformers (UK) #38 - "Brainstorm!" Transformers (UK) #39 - "Prime Time!" Transformers (UK) #42 - "Crisis Of Command! (Part 1)"
Transformers (UK) #43 - "Crisis Of Command (Part 2)"
Transformers (UK) #44 - "Crisis Of Command (Part 3)"
Transformers (UK) #45 - "Icarus Theory (Part 1)"
Transformers (UK) #48 - "Dinobot Hunt (Part 2)"
Transformers (UK) #50 - "Dinobot Hunt (Part 4)"
Transformers (UK) #53 - "Rock And Roll Out!" Transformers (UK) #54 - "Rock And Roll Out!" Transformers (UK) #55 - "I Robot Master"
Transformers (UK) #56 - "I Robot Master"
Transformers (UK) #57 - "Plight Of The Bumblebee!" Transformers (UK) #60 - "Robot Buster (Part 2)"
Transformers (UK) #63 - "Second Generation (Part 1)"
Transformers (UK) #71 - "Command Performances"
Transformers (UK) #78 - "Target 2006 (Prologue)"
Transformers (UK) #79 - "Target 2006 (Part 1)"
Transformers (UK) #81 - "Target 2006 (Part 3)"
Transformers (UK) #83 - "Target 2006 (Part 5)"
Transformers (UK) #89 - "Aerialbots Over America"
Transformers (UK) #96 - "Prey (Part 1)"
Transformers (UK) #97 - "Prey (Part 2)"
Transformers (UK) #98 - "The Harder They Die"
Transformers (UK) #104 - "Resurrection (Part 2)"
Transformers (UK) #154 - "Toy Soldiers"
Transformers (UK) #223 - "Wanted Galvatron Dead or Alive Pt2 (Reprinted 114)"
Transformers (UK) #224 - "Wanted Galvatron Dead or Alive Pt2 (Reprinted 114)"
Transformers (UK) #231 - "Resurrection Pt2 (Reprinted 104)"
Transformers (UK) #232 - "Resurrection Pt2 (Reprinted 104)"
Transformers (UK) #246 - "Demons"
Transformers (UK) #249 - "Skin Deep"
Transformers (UK) #250 - "Skin Deep"
Transformers (UK) #251 - "Skin Deep"
Transformers (UK) #259 - "Primal Scream"
Transformers (UK) #260 - "Primal Scream"
Transformers (UK) #261 - "Primal Scream"
Transformers (UK) #263 - "Break Away"
Transformers (UK) #264 - "Desert Island Risk"
Transformers (UK) #265 - "Blood on the Tracks (Transformers vs G.I.Joe Pt 1)"
Transformers (UK) #265 - "Once Upon A Time"
Transformers (UK) #266 - "Blood on the Tracks (Transformers vs G.I.Joe Pt 1)"
Transformers (UK) #267 - "Blood on the Tracks (Transformers vs G.I.Joe Pt 1)"
Transformers (UK) #270 - "The Bad Guys Ball!" Transformers (UK) #274 - "Ashes. Ashes... (Transformers vs G.I.Joe Pt 3)"
Transformers (UK) #278 - "The House That Wheeljack Built"
Transformers (UK) #289 - "End Of The Road"
Transformers (UK) #308 - "The Enemy Within (Reprinted 13 17)"
Transformers (UK) #314 - "The Enemy Within (Reprinted 13 17)"
Transformers (UK) #316 - "The Enemy Within (Reprinted 13 17)"
Transformers (UK) #317 - "The Enemy Within (Reprinted 13 17)"
Transformers (UK) #325 - "Exodus"
Transformers (UK) Annuals #1985 - "Hunted"
Transformers (UK) Annuals #1986 - "In The Beginning..."
Transformers (UK) Annuals #1986 - "The Return Of The Transformers!" Transformers: The Movie #1 - "The Planet-Eater!" Transformers: The Movie #2 - "Judgment Day"
Transformers Universe #1 - "AIR - GRI"
G.I.Joe and the Transformers #1 - "Blood On The Tracks"
G.I.Joe and the Transformers #3 - "Ashes, Ashes ..."
G.I.Joe and the Transformers #4 - "... All Fall Down!" G.I.Joe and Transformers: Generation 2 #140 - "Goin' South"
Transformers: Generation 2 #2 - "All Or Nothing!" Transformers: Generation 2 #3 - "Old Evils"
Transformers: Generation 2 #8 - "Escalation!" Transformers: Generation 2 #12 - "A Rage in Heaven! (Part 4)"
Transformers: Generation 2 #0 - "Ghosts"
Convention Comics #2005 - "Descent Into Evil"
Transformers #2 - "Prime Directives (Part 2)"
Transformers #3 - "Prime Directives (Part 3)"
Transformers #4 - "Prime Directives (Part 4)"
Transformers #5 - "Prime Directives (Part 5)"
Transformers #6 - "Prime Directives (Part 6)"
Transformers: War and Peace #1 - "Chapter 1: New World Order"
Transformers: War and Peace #2 - "Chapter 2: Brothers' Burden"
Transformers: War and Peace #3 - "Chapter 3: Cold War"
Transformers: War and Peace #4 - "Chapter 4: Passive Aggression"
Transformers: Generation One #1 - "Night Of The Combaticons"
Transformers: Generation One #2 - "Black Sunshine"
Transformers: Generation One #3 - "Skyfire"
Transformers: Generation One #4 - "The Omega Effect"
Transformers: Generation One #5 - "Original Sin"
Transformers: Generation One #6 - "Atonement"
Transformers: Generation One #8 - "Extermination"
Transformers: Generation One #9 - "Lost And Found"
Transformers: Generation One #12 - "Transformers: Generation One"
More Than Meets The Eye: Transformers G1 #1 - "AER - COM"
More Than Meets The Eye: Transformers G1 #8 - "INDEX/GLOSSARY"
Transformers: The War Within #1 - "Transformers War Within"
Transformers: The War Within #2 - "Transformers War Within"
Transformers: The War Within #3 - "Transformers War Within"
Transformers: The War Within #5 - "Transformers War Within"
Transformers: The War Within #6 - "Transformers War Within"
Transformers - The War Within, Vol. 2: The Dark Ages #5 - "Confrontation"
Transformers - The War Within, Vol. 2: The Dark Ages #6 - "Conflagration"
Transformers - The War Within, Vol. 3: The Age of Wrath #1 - "The Age of Wrath (Part 1)"
Transformers / G.I.Joe #3 - "Trial By Fire"
Transformers / G.I.Joe #4 - "Wolves"
Transformers / G.I.Joe #6 - "The Iron Fist"
G.I.Joe vs Transformers #2 - "G.I.Joe vs the Transformers"
G.I.Joe vs Transformers #3 - "G.I.Joe vs the Transformers"
G.I.Joe vs Transformers #4 - "G.I.Joe vs the Transformers"
G.I.Joe vs Transformers #5 - "G.I.Joe vs the Transformers"
G.I.Joe vs Transformers #6 - "G.I.Joe vs the Transformers"
G.I.Joe vs. Transformers II #1 - "G.I. Joe vs. Transformers II"
G.I.Joe vs. Transformers II #2 - "G.I. Joe vs. Transformers II"
G.I.Joe vs. Transformers II #4 - "G.I. Joe vs. Transformers II"
G.I. Joe vs. Transformers III: The Art of War #1 - "G.I. Joe vs. Transformers III: The Art of War"
G.I. Joe vs. Transformers III: The Art of War #2 - "G.I. Joe vs. Transformers III: The Art of War"
G.I. Joe vs. Transformers III: The Art of War #3 - "G.I. Joe vs. Transformers III: The Art of War"
Transformers: Infiltration #3 - "Transformers: Infiltration Part 3"
Transformers: Infiltration #4 - "Transforers: Infiltration Part 4"
Transformers: Infiltration #5 - "Transformers: Infiltration Part 5"
Transformers: Infiltration #6 - "Transformers: Infiltration Part 6"
Transformers: Escalation #3 - "Transformers: Escalation"
Transformers: Devastation #1 - "Transformers: Devastation"
Transformers: Devastation #2 - "Transformers: Devastation"
Transformers: Devastation #3 - "Transformers Devastation"
Transformers: Devastation #4 - "Transformers: Devastation"
Transformers: All Hail Megatron #1 - "Transformers: All Hail Megatron"
Transformers: All Hail Megatron #4 - "Transformers: All Hail Megatron"
Transformers: All Hail Megatron #5 - "Transformers: All Hail Megatron"
Transformers: All Hail Megatron #6 - "Transformers: All Hail Megatron"
Transformers: All Hail Megatron #7 - "Transformers: All Hail Megatron"
Transformers: All Hail Megatron #8 - "Transformers: All Hail Megatron"
Transformers: All Hail Megatron #9 - "Transformers: All Hail Megatron"
Transformers: All Hail Megatron #10 - "Transformers: All Hail Megatron"
Transformers: All Hail Megatron #11 - "Transformers: All Hail Megatron"
Transformers: All Hail Megatron #12 - "Transformers: All Hail Megatron"
The Transformers: Megatron Origin #3 - "Megatron: Origin"
Transformers Evolutions: Hearts of Steel #1 - "Evolutions: Hearts of Steel #1"
Transformers Evolutions: Hearts of Steel #2 - "Evolutions: Hearts of Steel #2"
Transformers Evolutions: Hearts of Steel #3 - "Evolutions: Hearts of Steel #3"
Transformers Evolutions: Hearts of Steel #4 - "Evolutions: Hearts of Steel #4"
Transformers: Generations #3 - "Rock and Roll-Out"
Transformers: Generations #4 - "Plight of the Bumblebee"
Transformers: Generations #12 - "Buster Witwicky and the Car Wash Of Doom"
Transformers: Animated Movie Adaptation #2 - "Transformers Animated Movie Adaptation"
Transformers: Animated Movie Adaptation #4 - "Transformers Animated Movie Adaptation"
Transformers: Spotlight #13 - "Mirage"
Transformers: Spotlight #17 - "Jazz"
The Transformers: Target 2006 #1 - "The Transformers: Target 2006"
The Transformers: Target 2006 #2 - "The Transformers: Target 2006"
The Transformers: Target 2006 #3 - "The Transformers: Target 2006"
New Avengers/Transformers: Man and Machine #1 - "New Avengers/Transformers: Man and Machine"
New Avengers/Transformers: Man and Machine #2 - "New Avengers/Transformers: Man and Machine"
New Avengers/Transformers: Man and Machine #3 - "New Avengers/Transformers: Man and Machine"
New Avengers/Transformers: Man and Machine #4 - "New Avengers/Transformers: Man and Machine #4"
Transformers (Ongoing) #1 - "Transformers"
Transformers (Ongoing) #2 - "Transformers"
Transformers (Ongoing) #3 - "Transformers"
Transformers (Ongoing) #5 - "Transformers"
Transformers (Ongoing) #6 - "Transformers"
Transformers (Ongoing) #7 - "Transformers"
Transformers (Ongoing) #9 - "Transformers"
Transformers (Ongoing) #10 - "Transformers"
Transformers (Ongoing) #11 - "Transformers"
Transformers (Ongoing) #12 - "Transformers"
Transformers (Ongoing) #14 - "Transformers"
Transformers (Ongoing) #15 - "Transformers"
Transformers (Ongoing) #16 - "Transformers"
Transformers (Ongoing) #17 - "Transformers"
Transformers (Ongoing) #18 - "Transformers"
Transformers (Ongoing) #21 - "Transformers"
Transformers (Ongoing) #25 - "Transformers"
Transformers (Ongoing) #27 - "Transformer"
Transformers (Ongoing) #29 - "Transformers"
Transformers: Bumblebee #2 - "Transformers: Bumblebee"
Transformers: Robots in Disguise #1 - "The Autonomy Lesson"
Transformers: Robots in Disguise #2 - "The World & Everything In It"
Transformers: Robots in Disguise #3 - "Stick Together"
Transformers: Robots in Disguise #5 - "A Better Tomorrow"
Transformers: Robots in Disguise #7 - "Interference Patterns"
Transformers: More Than Meets The Eye #0 - "The Death Of Optimus Prime"
Transformers: More Than Meets The Eye #1 - "Liars, A to D Part 1: How to Say Goodbye and Mean It"
Infestation 2 #1 - "The Transformers Issue 1"
Transformers: Autocracy #1 - "Law and Disorder"
Transformers: Autocracy #2 - "Parasites"
Transformers: Autocracy #3 - "The Hunt For Soundwave"
Transformers: Autocracy #4 - "Cause and Effect"
Transformers: Autocracy #5 - "Ruins"
Transformers: Autocracy #8 - "Overthrown"
Transformers: Autocracy #9 - "Transformation"
Transformers: Autocracy #10 - "Rise"
Transformers: Autocracy #11 - "Broadcast"
Transformers: Autocracy #12 - "Endgame"
Transformers One-Shots from IDW Publishing #Annual 2017 - "Ghost Stories"
Transformers: Till All Are One #6 - "Desperate Times"
Transformers: Till All Are One #7 - "Desperate Measures"
Transformers: Till All Are One #8 - "Rubicon"
Transformers: Till All Are One #9 - "Heavy"
Transformers: Till All Are One #10 - "The Price Of You"
Transformers: Till All Are One #11 - "If I Know You"
Transformers: Till All Are One #2017 Annual - "The Chosen One"
Optimus Prime #13 - "The Dead Come Home: Part 1 (of 2)"
Optimus Prime #14 - "The Dead Come Home: Part 2 (of 2)"
Optimus Prime #15 - "The Falling, Chapter 1: Surfeit of Primes"
Optimus Prime #16 - "The Falling, Chapter 2: Another Mine"
Optimus Prime #Annual 2018 - "THUNDERCRACKER IN: STARSCREAM: THE MOVIE"
Optimus Prime #17 - "The Falling, Chapter 3: The Ground"
Optimus Prime #19 - "The Falling, Chapter 4: The Hallowing"
Optimus Prime #20 - "The Falling, Chapter 5: Endless Forever"
Optimus Prime #21 - "The Falling, Chapter 6: Unforgivable"
Optimus Prime #25 - "Post"
Revolutionaries #5 - "Strange Visitors"
Revolution: Aw Yeah! #1 - "Revolution: Aw Yeah! #1"
Revolution: Aw Yeah! #3 - "Revolution: Aw Yeah! #3"
Rom Vs. Transformers: Shining Armor #1 - "Rom Vs. Transformers: Shining Armor #1"
Rom Vs. Transformers: Shining Armor #2 - "Rom Vs. Transformers: Shining Armor #2"
Rom Vs. Transformers: Shining Armor #3 - "Rom Vs. Transformers: Shining Armor #3"
Rom Vs. Transformers: Shining Armor #4 - "Rom Vs. Transformers: Shining Armor #4"
Rom Vs. Transformers: Shining Armor #5 - "Rom Vs. Transformers: Shining Armor #5"
Transformers: Unicron #0 - "Our Darkest"
Transformers: Unicron #1 - "Transformers: Unicron #1"
Transformers: Unicron #1 - "Ad Infinitum"
Transformers: Unicron #2 - "Stranger Eons"
Transformers: Unicron #3 - "Our Finest"
Transformers: Unicron #4 - "Road's End"
Transformers: Unicron #5 - "Transformers: Unicron #5"
Transformers (2019) #1 - "The World In Your Eyes Part One"
Transformers (2019) #2 - "The World In Your Eyes Part Two"
Transformers (2019) #3 - "The World In Your Eyes Part Three"
G1 1985: Episode #24 - Atlantis, Arise! G1 1985: Episode #48 - Kremzeek! G1 1985: Episode #65 - B.O.T. 5,686 pages were recently viewed by 857 unique visitors. This page was viewed 1 times on Monday, April 22nd 2019 12:03pm CDT. © 2019 Seibertron, Inc. DBA Seibertron.com. All Rights Reserved. Established June 2000. Seibertron.com is owned by Ryan Yzquierdo.